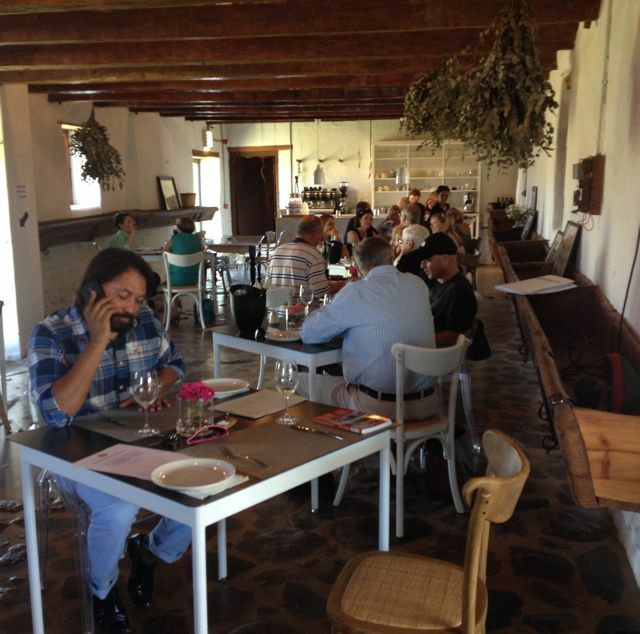 Outlying Durbanville wine tourism destination, Phizante Kraal, established Anno 1698, according to its letterhead, has come a long way – and not just over those three centuries or so. Until a few years ago, it was barely open at all for tasting – largely because it sold the vast majority of its grapes to other cellars. Indeed, it still has no cellar of its own. But it does make wine now – and has done for nearly a decade. But until last year, you could only have tasted it once a month on a Saturday morning if the wind was in the right direction. Now things are a lot more professional and a bit more regular – though Mondays, please note, the restaurant is NOT open, as signs tell you as you come up the drive. Sunday, too, in fact. But the new tasting and eating venue is very much worth getting the day and time right for. An ancient cow byre has been elegantly converted to a long dining room, complete with ancient troughs and less than level cobbled floor, with a very funky resin finish. And the next door tasting venue, in contrast, is all glass and light and an even funkier flavour jar installation, which has to be seen (and smelt) to be believed… comfy sofas and armchairs complete the picture. Outside, the minimalist garden is coming on apace as the herbs and shrubs establish themselves adjacent to the courtyard where outside tables are an option for tasting or coffee (full meals are only served inside for now). Opening Times: 8.30pm to 4.30pm for tasting Monday to Friday. Saturday 8.30am to 2.30pm. Restaurant open for lunch every day except Sunday and Monday. Brunch on Saturdays. Telephone: 021 976 2114 and for other farms, see our listings in our book, downloadable from our website: see below. Best thing about the Durbanville Wine Valley? The views, the food, the wine and the gees – always a warm welcome and so close to Cape Town! Adults or children? All Durbanville festivals and farms are child-friendly. Red or white? White is the signature here – cool climate Sauvignons and intriguing blends – but Merlot is not far behind. Best time to go? Festival time, if you like friendly crowds and to taste all the farms offerings in one place: otherwise any time in spring to catch the new Sauvignon Blancs before they sell out!